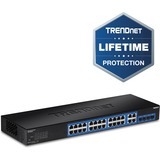 TRENDnet's 28-Port Gigabit Web Smart Switch, model TEG-284WS, is a cost-effective switch solution for high-speed gigabit applications. Advanced traffic management, access management controls, trouble shooting, and monitoring protocol support makes this a powerful backbone solution for SMB networks. The web-based management interface offers features for traffic control, troubleshooting, access controls, and monitoring. Provides an easy to use web-based GUI management for reduced switch configuration complexity and offers a combination of SMB management features for easy deployment. Offers four shared gigabit SFP slots to allow for long distance fiber optic connections. Fanless rack mountable 1U metal housing features 24 gigabit ports and 4 shared gigabit ports (RJ-45/SFP).